XC5-XS is an on-premises virtualized SIP voice core routing and SBC solution that can be used to provide cloud phone services to your customers. It routes voice and video calls, play network announcements and protects against Advanced Persistent Threat (APT) and denial-of-service (DDoS) attacks. It provides traditional telecoms features, business SIP trunking and Centrex features for ISPs. It is a fully redundant system connected to replicated databases. Scalability is achieved by adding more virtualized nodes or databases, all running in a Hot-Hot clustered environment. The cluster can be spread across multiple data centres. Quickly build a virtual receptionist to answer incoming calls. Add menus so callers can be directed to the right place e.g. "Press one for support". 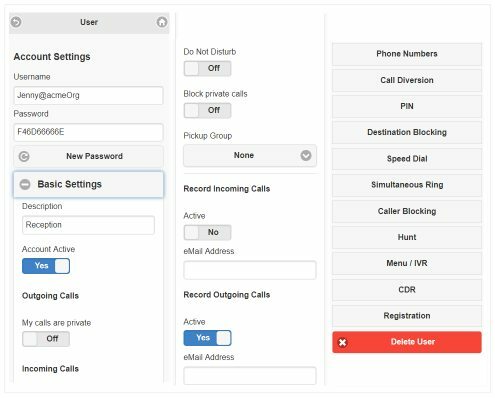 Assign a number and distribute incoming calls to a group of people. Calls can be queued until someone is available to answer. On-hold music can be played from a custom source, like marketing prompts, or from an internet radio. Add more complex Auto Attendants and call queing. Redirect inbound calls based on critireria like agent skills and experience. Users and admins can change account setting in realtime, from anywhere. XC5-XS includes a virtualized multi-tenant business feature set to replace an on-premises PBX. All business customers (organisations) can be run on the same platform in a single instance. Features include basic user settings, organisational setting, voicemail, music on hold and auto attendant. The web portal is included as a way to get started quickly using XC5-XS. There is also a JSON web API that allows all user and organisational settings to be made via third party integration. These settings are often controlled by the carrier or the organisations administrator via the web portal. All changes are immediate. Each setting can be controlled by the individual user (or the organisations administrator) via the web portal. All changes are immediate. Toll-free enables anyone to call for free from almost any phone within the same country. It can provide them with enhanced features such as Menus, Call Queuing and Call Diversion. All inbound calls to a toll-free number are traditionally charged to the customer that owns the toll-free number. Confidential Pin Restricts access to your Toll Free number by requiring callers to enter a valid PIN before their call is connected. Extension Routing Recognise a valid extension entered by a caller and proceed to that extension.